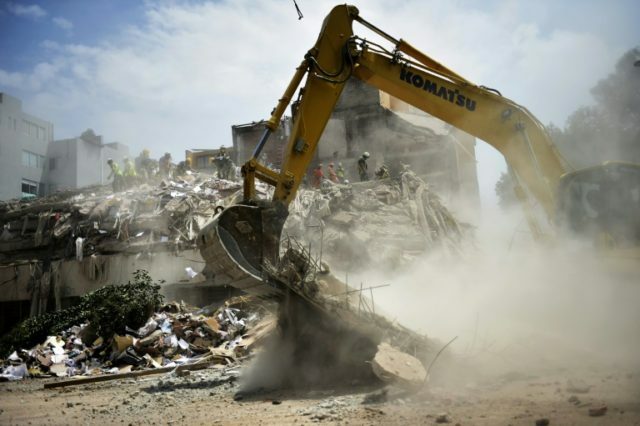 Mexico City (AFP) – Allegations of negligent construction and oversight began to fly Monday after deadly building collapses during Mexico’s earthquake, as hope faded of finding more survivors of a disaster that killed more than 300 people. The most-watched collapse site — a school where 19 children were killed last week — was built illegally on a site reserved for housing, according to local media reports. The government has also come in for criticism from anguished families of people still missing after Tuesday’s earthquake. Just 35 percent of Mexicans approve of President Enrique Pena Nieto’s response, according to a poll by the newspaper Reforma. But Pena Nieto has been careful to insist that authorities will not send in the bulldozers to start cleanup until rescuers are absolutely certain there are no more people in the rubble. The building where Estrada’s cousin was located, at 286 Alvaro Obregon Avenue in the trendy Roma neighborhood, is now the main search site. It crumpled into a tangled heap of concrete and steel with 132 people inside. Of the capital’s 8,700 schools, 103 reopened Monday, the education ministry said. The rest were due to resume classes in the coming days, after undergoing architectural inspections. The stakes are high for an already widely criticized government. After an earlier earthquake on September 7, all schools were given a clean bill of health. An aftershock that shook Mexico City on Saturday has made the country all the more jittery. And the sense of vulnerability has only been heightened by the fact that Tuesday’s earthquake struck on the anniversary of a 1985 quake that killed more than 10,000 people, the worst in Mexican history. A candlelight vigil for the victims of all three recent earthquakes is planned for October 15 in Mexico City’s central square. The latest death toll stands at 324 people — 186 of them in Mexico City.